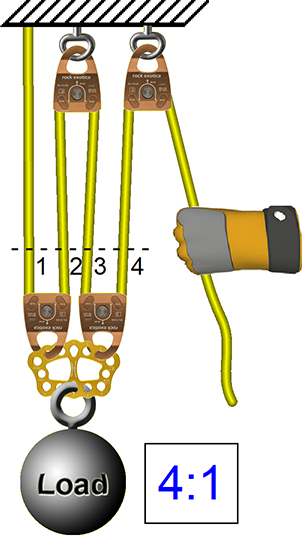 The previous page explained how to calculate the mechanical advantage of a rope-and-pulley system using the T-System. This page explains the "counting the lines" method. "Counting the lines" is an easy to use method that works best with simple mechanical advantage systems, although this method can be used with compound systems. 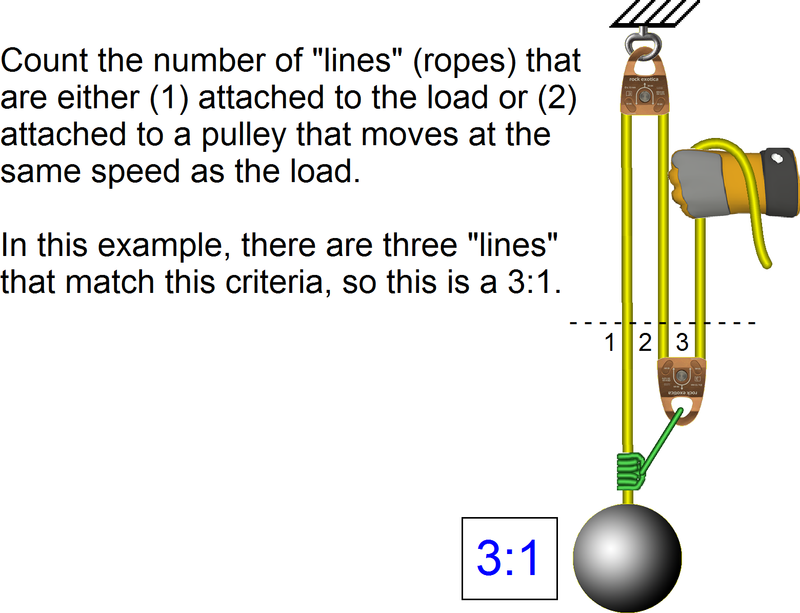 To calculate the mechanical advantage by counting the lines, count the number of rope segments (aka "lines") that are either connected to the load or that are connected to a pulley that will travel at the same speed as the load. Referring to this next illustration, three "lines" match this criteria, so this is a 3:1 system. Isolate the simple systems within the compound system. 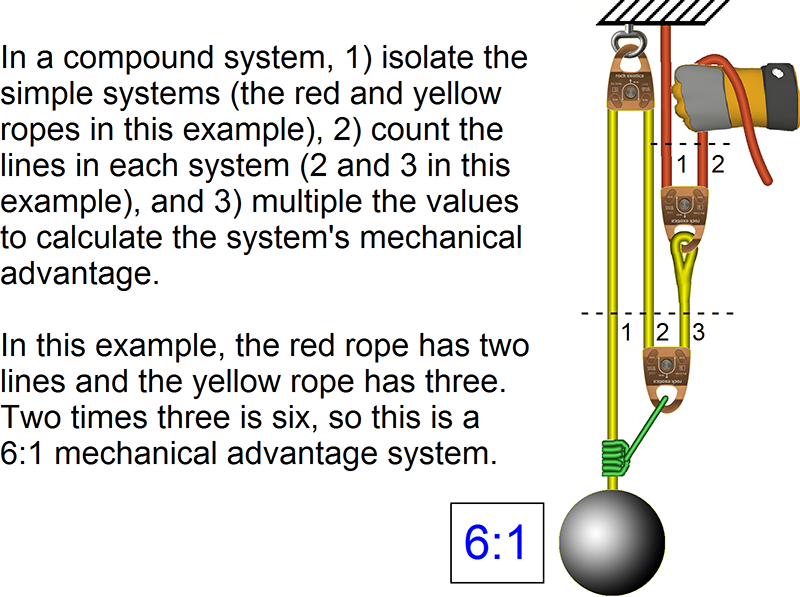 Use the "count the lines" method to determine the mechanical advantage of the individual simple systems. 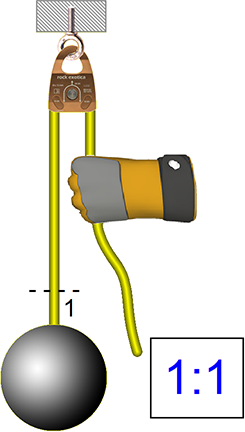 Multiple the mechanical advantage of the individual systems to determine the overall mechanical advantage. The "counting the lines" method of calculating mechanical advantage is easy and blazingly fast. You simply count all ropes (aka "lines") that are connected to the load or that are connected to a pulley that will move at the same speed as the load. This method is much faster than the T-System when calculating the mechanical advantage of simple systems, although it's not always intuitive when working with compound systems and it can't solve complex systems.